We welcome two new BJI contributors, Royalflusher and Zengrifter. Royalflusher will write about his video-poker playing trips to Las Vegas, which are humorous, tongue-in-cheek, and cover much more than just gaming. Zengrifter is a blackjack pro, and this month he'll describe his first trip to the casinos in Blackhawk and Central City, Colorado (you'll read about more winning techniques than card counting in his lively reports). We have two reports on blackjack playing conditions in four Las Vegas casinos: Monte Carlo and NYNY (by KC Brooks), and Palace Station and Stratosphere (by Stu D. Hoss). The second installment of playing on blackjack teams by Frank Scoblete appears in this issue as well as Scoblete's Atlantic City Blackjack Report (with a slightly different format, as well as a special deal on some of his books). Paul Wilson continues his strategy tips with hands that contain aces, this month for soft doubling. Tournament blackjack expert Monkeysystem reviews a Midwest blackjack tournament that he recently played and liked. John Grochowski responds to reader's questions on blackjack side bets; video poker machines where you can specify the cards for your royal flush; and video poker machines that can make it more difficult for skilled players. Last, but not least, Jerry "Stickman" gives a good primer on playing progressive video poker machines. This article appeared in issue #88 of the BJI; it offers some good tips on money management for the casual, non-pro, blackjack card counter. If you visit different casinos, you will find the app to be especially useful because it uses GPS technology to show you all of the casinos within a 100-mile radius of your current location. You can also search for casinos by name, state or zip code, plus there's a tab to provide instant turn-by-turn driving directions. Detailed information on each casino: name, address, phone numbers (with one-touch calling), room rates, buffet prices, games offered, senior discounts, RV parking policies and special features. Exclusive discount coupon offers for more than 80 casinos, including FREE: rooms, food, drinks, shows, gambling money, matchplay bonuses, plus much more! For more information, or to download the Apple version of the app, go to https://itunes.apple.com/us/app/american-casino-guide/id574179564?mt=8. 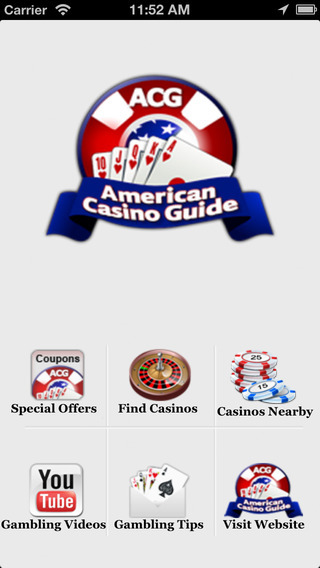 If you have an Android device, go to http://play.google.com/store/apps/details?id=com.sb.android.acg You can also go to the Apple App Store or Google Play store and search for "American Casino Guide." ON SALE FOR $39.95... 60% OFF!! To honor Vinny's passing, we are extending his ground-breaking e-book on sale for January... only $39.95, 60% off! "Valuable App! Worth much more than its asking price. 10 stars plus. I use it just about everyday." "This BJ app is, by far, the most comprehensive available. Moreover, the customer support is impeccable. You can't go wrong with this app. 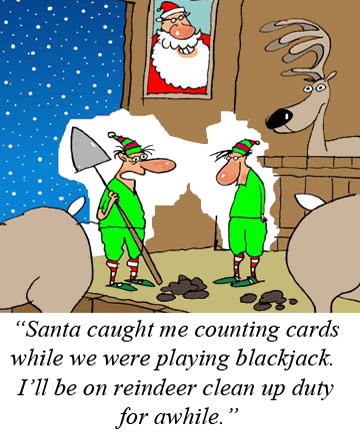 Use it properly, and you'll do well at casinos or for just fun." 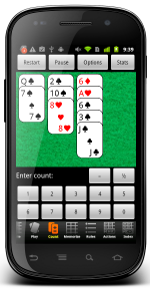 "Great blackjack training application with card counting simulation. 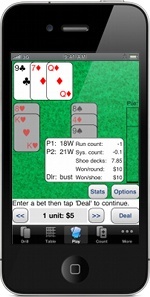 It really changed the way I think and play blackjack." "This month I saddled up and visited two casinos in the North Strip area. Despite very different addresses, these two properties have one thing in common, namely, they aren't catering to or looking for high-rollers. One offers significantly better gaming opportunities, while the other has a few more nifty 'bells and whistles.' Let's get started..."
"This month I went to the south end of the Strip to check out the gaming action at New York New York and Monte Carlo casinos, both operated by MGM Resorts. This is what I found..."
"Recently I had the opportunity to spend five weeks in the Denver, CO area on business and I was determined to make a series of first-time visits to the Blackhawk and Central City casino venues located 60 minutes away. I loosely planned to invest 40-60 hours in play during my five-week business trip. Let's get started..."
"I'm going to give you a couple of experiences with all the closed casinos since I played in almost all of them; and for the casinos that still operate, I'll give my regular report..."
"If you read my column in last month's Blackjack Insider, you'll recall that I discussed playing some common hands involving Aces and how I'd seen a plethora of player missteps in recent outings. This month I'm going to continue the Aces theme and examine double-down opportunities involving player Aces..."
"Continuation of an excerpt from Frank Scoblete's new book 'I Am a Card Counter: Inside the World of Advantage Play Blackjack'..."
"I like this tournament, and I try to attend as often as possible. Here are the reasons why..."
"John Grochowski answers reader's questions on blackjack side bets; video poker machines that allow you to designate the cards for your own royal flush; and video poker machines that could adjust and get tougher to beat based on the player's skill..."
"Savvy, video poker player Royalflusher's trip report, which includes his humorous, tongue-in-cheek take on the true events (good and bad) that happened..."
STICKMAN'S STANCE: PLAYING PROGRESSIVE VIDEO POKER by Jerry "Stickman"
"Jerry 'Stickman' explains how to attack progressive video poker machines..."